Andrea Askowitz doesn’t mince words, and this book’s title is just the start. 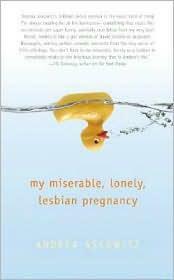 In My Miserable Lonely Lesbian Pregnancy, Askowitz takes her readers on a blow-by-blow tour through her first trimester, back to her “before pregnancy” days, and then all the way through her second and third trimester, her delivery, and her postpartum period. In a blog-like style, she explains in detail her daily struggles with the decisions surrounding conception, her personal relationships, her thoughts on religious traditions, and just how much she disliked being pregnant. No detail or complaint is spared. It isn’t often that the story gets told about the challenges encountered by single, lesbian women hoping to conceive. The many difficult decisions to be made about how to conceive are compounded by the other decisions and issues faced by women during conception and pregnancy - be they straight, gay, single or partnered. Askowitz offers an unflinching glimpse in to the tough decisions she had to make, as well as her heartache, physical pain, loneliness, and her uncertainty. The tone of the book can be off-putting. There is little “pregnancy is beautiful” sentimentality, and readers won’t find many “I’m a tough, single woman, and I can handle this” rallying cries. The writing can also be a little disconnected at times, and the connection between one story and another not always obvious, but the story is the author’s to write, and she appears to have written it in a style that is meaningful to her. After finishing the book, which has a very strong and touching section on the postpartum period, many readers will find that they appreciate that the story wasn’t written through rose-colored glasses. Honesty is My Miserable Lonely Lesbian Pregnancy's greatest appeal.